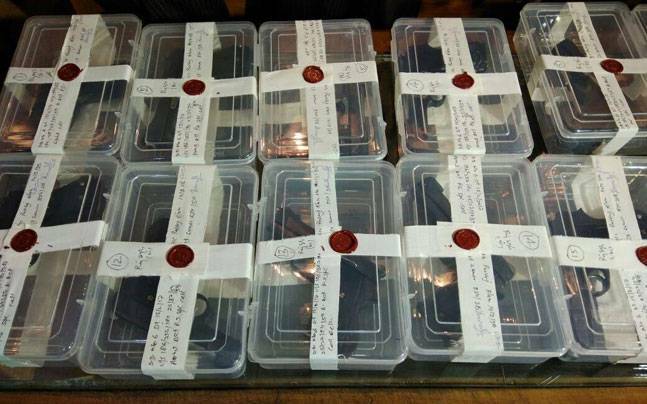 New Delhi, Nov 11: A 26-year-old man, kingpin of an interstate racket supplying illegal firearms to criminals in Delhi, Haryana and Uttar Pradesh, has been arrested with 20 automatic pistols and 100 cartridges from Uttar Pradesh's Jhansi city, police said on Saturday. Police said the accused, Salman, a resident of Jhansi, was carrying a reward of Rs 1 lakh on his head. "He was arrested from Jhansi on Thursday night when he was on his way to deliver a consignment of the seized arms to his contact in Uttar Pradesh," Deputy Commissioner of Police P.S. Kushwah said. Salman's arrest could be made following the arrest of two arms suppliers -- Kailash, 35, and Maal Singh, 37, residents of Dhar district of Madhya Pradesh. They had disclosed about Salman's illegal arms and ammunition trade in Delhi and adjoining states. "On interrogation, Salman told police that after he left studies, he joined a gang of arms suppliers and used to purchase sophisticated firearms and ammunition from Khargone and Dhar districts of Madhya Pradesh," Kushwah said. For the last three years, he had started his own interstate gang and was supplying arms to criminals operating in the Delhi-UP-Haryana region, Kushwah said. Salman used to charge Rs 15,000-20,000 for each pistol, he added.